Avascular necrosis (AVN) or osteonecrosis is a condition that occurs when there is interruption in the supply of blood to the bone causing the bone to collapse. It is commonly found in the upper leg, upper arm, knees, shoulders, and ankles. Dislocation or fracture of the thigh bone leading to disrupted blood supply to the bone and trauma-related avascular necrosis. Chronic use of inflammation-fighting drugs orally or intravenously can be a cause for all cases of non-traumatic AVN. According to doctors these drugs reduce the body’s ability to breakdown fatty acids causing them to collect in the blood vessels making them narrow and reducing the supply of blood to the bone causing necrosis. Excessive use of alcohol- like anti-inflammatory drugs and excessive alcohol causes cholesterol to build in the blood vessels and decreases the supply of blood to the bones. 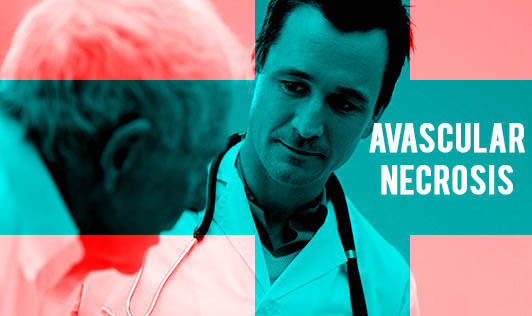 Blood clots, inflammation, and damage to the arteries are all reasons of AVN in people. Gauchers Disease- A genetic disease in which large quantities of fatty substances accumulate in organs. In its early stages, AVN typically show no symptoms; however, as the disease progresses it becomes painful and in severe cases the bone and the joint may collapse and it can even interfere with your ability to use the joint. The goal of treatment for AVN is to improve or ensure function of the affected joint, stop the progression of bone damage and reduce pain.